Pelayo-Woodward said that Day of the Dead is a tradition that links back to the Aztec civilization. It’s a day where one remembers loved ones who have passed away, and that they are still with them even though they are gone. “I think for some people it may seem strange, but it’s just a way of how we in different cultures view the cycle of life,” Pelayo-Woodward said. 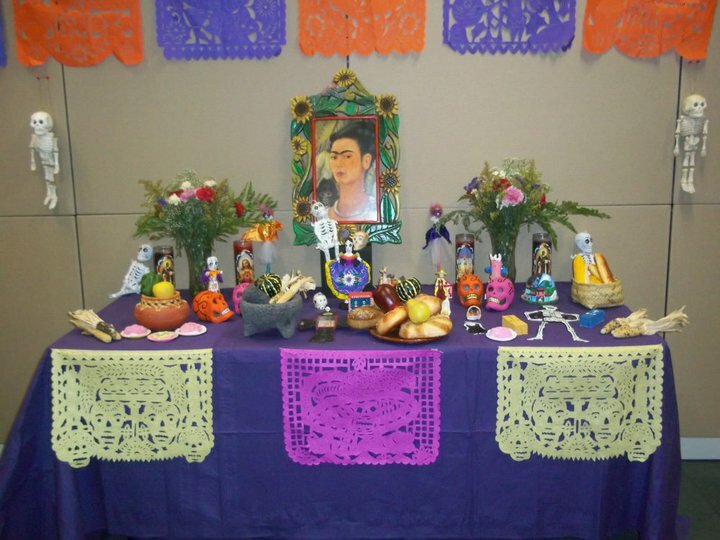 Every year since the 1990s, Pelayo-Woodward has partnered with the art education department to include art students in teaching others about Dia de los Muertos. Students will help work on altars that will be put up in the MC as well and make a lesson plan for children to learn about the celebration. On Oct. 31, two groups of children will come to the Multicultural Center to learn about the celebration, Pelayo-Woodward said. The children will look at the altars and then art students will do a lesson on what the meaning of the celebration is. Finally, the children get to do paper flowers and puppets. “It’s a whole day with the children,” Pelayo-Woodward said. Maria Vazquez, a first year accounting major, was born in Minnesota by her Mexican parents, but spent five years in Mexico from first grade to fifth grade. Vazquez said that thinking about loved ones is an important and meaningful part of the celebration. The exhibit in the Multicultural Center will be up from Oct. 23 to Nov. 5. Also on Oct. 23, the UMD Communication Department will host professor Alberto Gonzalez of Bowling Green State, who will focus his speech on how activism and art surrounding Dia de los Muertos has affected change in the community. The event will take place in the Rafters at 12 p.m.